​One of the most common issues with most cars is a brake fluid leak. This problem tends to show in many different ways and provide all kinds of issues. But of course, the main difficulty with having brake fluid leaking from your car is that the brake will eventually not work like it used to. And a braking system that doesn’t work correctly is always dangerous. That’s why we want to help you understand what happens when this colorless and oily fluid starts to leak out of your car. If your car has a puddle or you can notice small drops coming out of the vehicle of this seemingly colorless fluid, it’s probably time to look for a fix. Follow this guide and get to know more about why this happens and how you can fix it. How the Hydraulic Braking System Works? The hydraulic brake system transfers power through a set of hoses, tubes, cylinders, and other components using brake fluid. This way the car can stop or lower down the speed according to your needs. But because this brake fluid is essential, any vehicle that uses a hydraulic braking system wouldn’t work without it. When you press the brake pedal down, the brake liquid transfers the movement and force through the hydraulic system towards the brakes in the wheels. This system is closed, which means you have pedals, switches, brake lines, cylinders, a reservoir, a few pistons, and more. Sometimes, these components get damaged or broken, which could cause several issues. Among the common issues when the brake system malfunctions, you’ll find brake fluid leaks. When any of the components breaks, wears out with time, or gets damaged – brake fluid may start to leak and make the whole system malfunction. Now that you know a little about the braking system of most cars, it is time to learn about what causes it to leak brake fluid. Whether it is a hole, a splitting, or broken part in the lines – brake fluid will start to come out. As the lines that bring the liquid back and forth through the braking system, you’ll experience a sudden change in feel when braking. Due to the hole or breakage in the line, the pressure of the brake won’t be there so it will feel loosen and may not even offer enough braking power. Sometimes also named the bleeder valves, you’ll find them in the brake calipers. These bolts or valves remove the fluid from the brake to send it to other parts of the braking system. When it malfunctions, it is common to experience braking problems. This mostly happens when the brakes were recently changed or the fluid flushed, and then the bolts weren’t adequately installed back. The master cylinder is the part of the braking system where most of the brake fluid passes through. It tends to wear out with time and mileage, so it is one of the common culprits when braking fluid leaks. The typical way to know whether it is a master cylinder issue is that you’ll have to start pumping the brake to make it work, or eventually you’ll find large puddles of fluid underneath the car. Most wheel cylinders or calipers start leaking out fluid when they are broken. The most telling thing when this happens is brake fluid in the edges of the wheel, as the liquid tends to move towards the wheel when leaking. You’ll start feeling a wide array of symptoms when braking fluids leaks. Follow up to learn more. There are several ways you can tell when brake fluid starts leaking out of the car. But all of them offer different ways to find out. The most important and sometimes the first symptom most cars experience when brake fluid is leaking is a warning light in the dashboard. Other problems with the brake may not even be evident when this happens, but there’s no doubt that there’s something fishy already with the braking system. Sometimes, this may not even mean that there’s a brake fluid leak. However, it is one of the first signs and pretty likely the beginning of something worse. If you see a warning light in the dashboard, check the car as soon as possible or take it to the mechanic before it’s too late. When you push the brake pedal, it should be firm and strong, with an almost immediate effect on the brakes. But when the brake fluid is leaking, it is common to push down the pedal and feel a sort of squishy or spongy effect. This happens because as the fluid starts to leak out, air starts to get in and makes the whole braking system function incorrectly. A hydraulic brake system should only have fluid inside, so even the slightest impurity, including air, can make the pedal feel softer than it should and eventually damage the effectiveness and safety of the brake. Similar to when the pedal feels weird when pushed, sometimes it happens that you’ll have to push the brake all the way down to make it work. This is one of the most definite signs that brake fluid is leaking. As the fluid leaves the system without liquid, the braking process will slow down and don’t act as rapidly. Eventually, you’ll have to push the pedal more than before to make it work, until it doesn’t anymore. This is called the “brake pedal sink” among many other names. And it means that the braking system doesn’t have enough fluid to work with. It is also common to experience no resistance when pressing the brake until it’s very far down, which is also a sign that you have a leak. If you feel something like this, you’ll have to fix the leak and replace all the fluid as soon as possible. There’s probably not a more obvious way to tell that there’s a leak of brake fluid than seeing fluid underneath the car or around the wheels. This brake liquid is commonly clear or yellow, sometimes a little dark when it is old. It smells weirdly close to food oil and feels exactly like it when you touch it. If you see something like this close to the wheels or where the brake reservoir is, there’s almost no doubt you’re suffering from a brake fluid leak. We recommend checking the reservoir to see how much fluid there is, or taking the car directly to the mechanic to prevent any possible accident. Sometimes you may not experience any problem with the brake until the caliper or the clutches start to burn. You’ll know because a very perceptible smell of burning and probably even smoke starts to come out from the wheels. This mostly happens when you brake too hard, but it is almost always due to lack of brake fluid, so the clutches or calipers start to overheat. It is essential to fix this before it’s too late, as it is a sign that the brakes are soon to start failing or eventually break completely. Sometimes, however, may just be the parking brake that you didn’t turn off. But if it isn’t, be careful. This is maybe one of the most common ways to tell that a braking system is not working correctly. Grinding and squealing noises are pretty easy to notice, and almost always come from the brake pads. The sound may also come from debris, dirt, or rocks stuck in the caliper. And sometimes it means the brake pads are soon to wear out completely. But sometimes it could also mean that there’s no enough force in the braking system for the pads to make firm contact, due to lack of fluid. Make sure to check the fluid reservoir before crossing out other causes. When the vehicle starts to move towards one side when braking, there’s a high probability one of the calipers in that side of the car is not functioning correctly. When a caliper doesn’t function as it should, there’s a high chance it is leaking brake fluid, so it doesn’t have enough force to stop the wheel or does it with more or less pressure than others. This eventually causes the car to move to a side when braking. When the brake fluid starts to leak, most of the other components in the braking system can begin to wear out and get damaged. Eventually, this makes the whole system a little unreliable. Among the issues that could arise there’s a bounce effect when braking. It could be because the rotors are getting damaged, the caliper is not working correctly, the piston gets sticky with stress, and so on – causing the car to move weirdly when pushing the brake pedal. This is what you don’t want to experience with a malfunctioning brake system. When the car doesn’t stop anymore, or there’s little braking strength, there’s a high chance you’re running out of brake fluid. This could also happen to problems with the pads, calipers, rotors, clutches, pistons and so on. But most of the time it means the brake fluid is not doing its work. As it is obvious, a brake that doesn’t stop is arguably the most dangerous thing that a car could have. It could put the lives of other people in danger as well as your own. We recommend checking the fluid reservoir at the first sign of any of the previous symptoms of a leak. This way you can make sure whether it is indeed a leak or not. That’s why it is essential to check the braking system every now and then so you can prevent getting to this point. But surely, this is one of the last symptoms to appear and very rarely happens before any other. So don’t hesitate and take your car to the mechanic or fix it yourself at the first sign of a brake fluid leak. The first thing you need to do is to check the brake fluid reservoir in the hood of the car. This will tell you whether the car is full or whether it is lacking. If it requires, you can start looking for signs of leaks. The first sign you can look for is a fresh puddle under the vehicle. If you see something clear or yellowish that smells weird, there’s probably a leak. To make sure it is not steering fluid, check the level of this one to discard confusions. Otherwise, keep looking for the cause. Now you can park the car entirely and jack it up. It is useful to jack up the car on the side where you suspect the leak is at. Use a stand to keep it up and block the opposite wheels to prevent the car from moving. Now it all depends on the side you think the leak is. If it is close to the steering wheel, you can open the hood and look for signs of leaks (darkened areas, wet and oily parts, visible dripping) around the master cylinder and the brake booster. If it is close to the any of the wheels, try to search around the brake caliper in disk brakes. Also, look around the wheel cylinder in drum brakes. 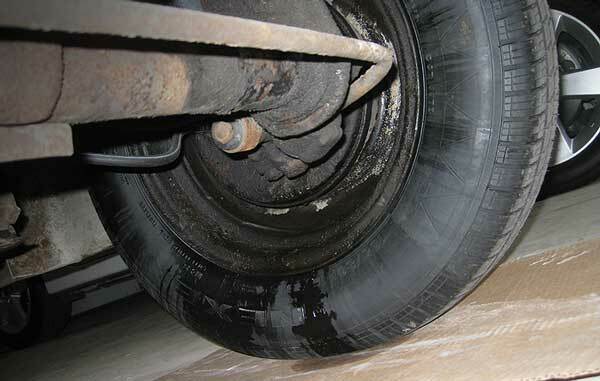 An oily tire, wet wheel, or any visible dripping in the connections is a probable leak you found. If the car was recently bleed out or any part of the braking system was replaced, you can check at the bleeder bolts or valves. They are behind the caliper. If you find anything wet or oily, you will have to remove the wheel to look closely to the disk brakes in search of a leak. Sometimes, the puddle from the leak appears around the car in almost any place. This means you may not have any specific component but the lines that are leaking. Check with a flashlight all the parts where the brake system lines pass through. You’ll need the car’s manual to do this. If you haven’t found the leak by now, you can take a last look all around the brake system. Check the master cylinder, the brake caliper or wheel cylinder, the modulator, the hoses, lines, and ultimately take a look around the hood. If you don’t find any sign of leak but still think there’s one, take your car to the mechanic and ask for a revision. Otherwise, keep reading to find the solution depending on where you found the leak. Now that you’ve found the leak on your car, it’s time to get rid of it. Here we are going to teach you the right way to check for a specific part that’s leaking and then fix it accordingly. This part is located in front of the brake booster which is a drum-like component that's commonly attached to the driver's side firewall. To make sure that it is a master cylinder leak, you’ll have to do a quick and easy last inspection before deciding to fix it. The fastest workaround is just to check the condition of the cylinder and its surroundings. This way, you can find out whether there’s a sign of a leak or brake fluid. However, you’ll also have to be sure whether it is an internal or external leak. An internal fluid leak will be a little difficult to find. This often happens when the internal pistons or seals wear out and the pressure leaks along with the fluid. You may not see any leak or fluid dripping when this happens, but you’ll surely feel it when driving with any of the mentioned symptoms. An external fluid leak, on the other hand, can be easily spotted with wet components, visual dripping, or any other similar sign. Whenever this happens, the only fix is to replace the master cylinder. Open the hood of the car and find the master cylinder. Remove the cap from the brake fluid reservoir. Then take all the liquid from it using a turkey baster or any similar tool. Place the old brake fluid in a container. Then disconnect all the electrical connections in the master cylinder as well as the brake lines. You can use your hands, but we recommend a line wrench to make it easy. Now it is time to loosen up the master cylinder by removing the mounting bolts that are commonly behind or at the sides. Use a socket wrench. Then take the master cylinder out of the car. Grab the new master cylinder and place it inside the same mounting area. If you have new mounting bolts, use them to secure the cylinder in its place. Now connect all the brake lines first then attach the electrical connectors to the new master cylinder. Finish by bleeding all the air from the braking system and adding new brake fluid. And that’s it. You have replaced the master cylinder and gotten rid of the leak. When it’s time to check the caliper/drum to be sure that the leak comes from it, you’ll have to take each the tire off the side to check on it. You have to start by loosening the wheel lugs on the tires. Then raise the tire and the wheel with a jack to elevate and work more comfortably. Use a stand to keep it up. Now you can remove the wheel and the whole assembly to take a look closer to the caliper or the drum. While inspecting closely, check the caliper or drum and the bleeder. If you don’t find anything visually, you can use your hard to touch the parts and see whether there’s anything wet from oil. Check with care around the brake disc or the wheel cylinder where the oil tends to go most of the time. If you don’t find anything, you can move the caliper from the mounting bracket without disconnecting the brake hose. Now you can take an even closer look to the caliper by looking at the brake pad, the boot, the piston, and the braking hose itself. Any sign of wet component or oily feeling will tell you there’s a leak. After finding a leak, the only solution would be to replace the part that’s leaking. Most of the time, the part to replace is the caliper or the drum. Next, we tell you how to do it. You may set a brake hose close to the caliper or a braking pad that’s worn out, but when the caliper is leaking, you’ll have to replace it immediately. The first step is to remove the old caliper. You’ll have to remove the bleeder bolt with a flare-nut wrench. You can use penetrating oil to loosen it up and take it out quickly. Then disconnect all the steel and rubber brake lines using the same type of wrench. If any of the lines are cracked or broken, you can replace it. Now take the pads, springs, sliders or shims out of the caliper. Remove any dust seal and place a piece of wood in the caliper behind the piston to prevent the parts from falling. Finally, let put an air compressor in low mode into the inlet port where the piston is so it can fall. Then replace it and lubricate the new piston. Insert it into its place with pressure using your fingers. Now you can put the new dust seal back to its place. Do the same with the brake pads, springs, sliders or shims. Anything that came with the new kit, replace it. Then reconnect the steel and rubber lines back. Remember to take the piece of wood first. Also, replace the brake bleeder bolt if needed. Finally, check that the part is not leaking anymore. Push the pedal down while the car is parked and see no fluid comes out. To finish just bleed the air out of the brake system and that’s it. You replaced the brake caliper completely. Test the car and see there’s no leak anymore. After checking the car’s manual, you can go on and remove the brake drum. Almost all cars have different drum-removing processes, so it’s essential to have the right instructions before doing it. After removing the drum, you can take a look at the wheel cylinder assembly. It will be located on top of the drum. Here you can start looking for any sign of wet spot or fluid telling you whether there’s a leak. The wheel cylinder also has internal pistons and other components inside like the calipers. So it is important to check everything in search of cracks or broken metal and brake fluid. You can take the rubber boots out on the wheel cylinder and check for further signs of a leak. After finding the leak, we recommend replacing the part completely. While it is possible to repair the wheel cylinder, only mechanics and technicians can rebuild the part. Otherwise, you can go on and replace it. Start by removing the brake drum after removing the wheel. The first thing to get rid of is the rubber plug behind the backing plate. Loosen up the adjuster so the brake shoes lower down so you can take the drum off. Typically, the drum is tightened up to the wheel, so you’ll have to use a hammer with penetrating oil to get rid of any rust that attaches to it. This way you can get it out more easily. Now remove the drum and place a pan or wide container under the brake shoes to not let any fluid fall to the floor. If the brake shoes have fluid on them, you’ll have to replace them as they’re very likely broken or damaged too. To finish just spray all the area and shoes with a brake cleaner to get rid of any dirt or fluid around. Then you’ll have to loosen up the steel brake line. Place a screw or bolt in one of the ends will help you prevent dripping. Now find the brake line fitting connecting to the wheel cylinder and find the screw to loosen it up with a socket wrench. Remove this fitting and place a vacuum or container below to prevent any further leakage from the steel line. After disconnecting the wheel cylinder from the brake system entirely, you can now remove it and replace it. Start by locating the retaining bolts in the backing plate. A socket wrench will help you loosen them up. Finish up by removing the old wheel cylinder and connecting the new one to the steel brake line. Screw the bolts again to the backing plate to attach the new cylinder, and that’s it. Finish up by bleeding out the air from the braking system, and you’ll have your car ready for testing. If none of the previous parts had the leak but instead it was the lines or the hoses, you’ll have to make sure completely. You can check each line on each tire individually by jacking up the tires one at a time. If you have the side where the leak may come from then start from that part on first. Remember to secure the care first and look for a stand to prevent the jack from doing all the work. With a flashlight, try to follow the lines going to each brake in each tire. Try to look for any sign of fluid or wet part. If you find any cracked or split line or hose, you may have noticed the cause. But if not, you can use your hands to touch the line and tubes in search of any wet feeling. If you indeed find the leak by touching the parts. You’ll have to make sure it comes from a line or a hose. The hose that’s darkened, with patches of rust, with rusty or sandy spots or wet will tell you where the leak comes from. A hose that’s leaking is sticky or spongy. You can also wipe them up with a clean cloth to see where the leak is coming from. After finding out the line or hose that’s damaged, split, or just cracked, you can then proceed to replace it. You’ll first have to disconnect the line or hose from the brake system. Start by disconnecting it from the wheel cylinder or caliper. Also, remove the brackets or clips that hold the line in place. Then you’ll need to disconnect the line or hose from the caliper. You’ll need a wrench for the bolts. Then you can remove the whole line or hose completely. Now you can attach the new brake line to the caliper. Remember to use the brackets or clips. Fasten up the bolts with the wrench. The new line will have to be the same length. Otherwise, cut it before attaching it to the caliper. Remember to put the tire and the wheel back again. Tighten up all the rest of connections. You'll have to also bleed the brake system out of the air to finish. Read up to learn how. Doing any of the previous fixes for a brake fluid leak will demand to bleed the brake. This means getting all the air out of the braking system so you can make it work correctly. First, you’ll need to have an assistant to pump the brake. Make sure to have one or else you will have trouble doing this by yourself. After leaving the assistant in the driver’s seat, you can start by removing the brake fluid reservoir cap. It’s generally located in the driver’s side of the hood, close to the firewall. Then you’ll have to remove all the fluid inside the reservoir. You can use a turkey blaster or any similar object to drain the liquid out. We recommend draining the liquid on a plastic or glass bottle. Finish up this part by cleaning the reservoir off any sediment or deposit inside by using a rag. Now that the reservoir is clean, you can place the new fluid in. Do this only when you have already fixed the leak problem. Don’t overfill the reservoir or eventually fill it with too little fluid. Find the car’s manual or any sign in the reservoir with the ideal fluid level to bleed the brake system. If there’s no info, fill just half of it. After filling the reservoir, it’s time to go under the car. Here, you’ll have to locate the bleeder of the brake system. It’s commonly found on the wheel cylinder or caliper depending on the type of brake. This part looks like a small tube coming out of either the cylinder or caliper. Attach a small hose to the bleeder from where you can bleed out the brake fluid. The other part of the tube or vinyl will have to finish in another plastic or glass container. This way, you won’t lose the new fluid. Now that the bleeder is ready and you have a tube connected to it, you can ask your assistant to push the pedal down. It is necessary not to push too hard down and instead leave it in its normal travel. Find the right pushing level by communicating with your assistant. Push the brake pedal down to build pressure inside the brake system until the new fluid starts coming out from the bleeder. Then rapidly put the hose out of the bleeder and screw the bleeder back and tighten it up. All air bubbles should be out by now. You can repeat this process with each brake if needed. Otherwise, you should top off the fluid reservoir with fluid or to its max level. Finish up by driving the car and trying out the brakes. Remember to have all the tools and resources with you before starting or else you may lose time or eventually bleed out the brake incorrectly. This process is a little complicated, so it is recommended to always go to an expert or mechanic first unless you are experienced enough to know what you’re doing. Get Rid of Brake Fluid Leaks Now! Having a brake fluid leak in your car is not an easy thing to fix or even check for that matter. But as long as you follow our advice and instructions, getting rid of a brake fluid leak by yourself shouldn’t be much of a job. However, only try doing what’s in this guide if you have any experience with mechanics. Otherwise, we recommend contacting a professional to prevent any further damage to your car.